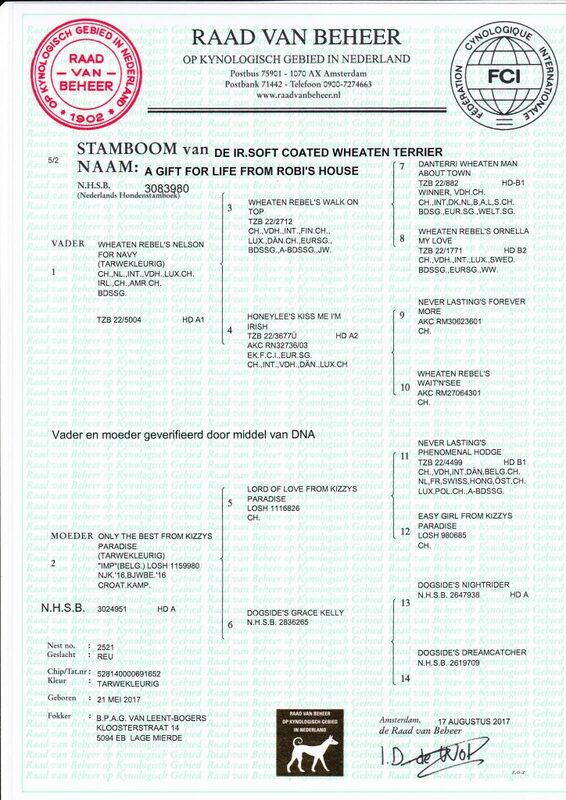 Our 4th wheaten called A Gift For Life From RoBi’s House aka Vino. He is male from our first A-litter out the combination Nelson and Oreana. Born on May 21, 2017. Vino is our very first male with a beautifull breedersname, even like his sister Amy. Vino is still a puppy with a very sweet and calm character. From the second weekend of September’17 made Vino his entrance in the show world! And was immediately awarded 1 Very Promising Minor Puppy with a bright future ahead! Vino has been BOB Minor Puppy and BOB Puppy many times. 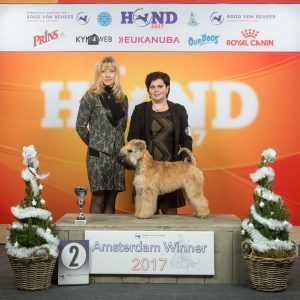 During the Amsterdam Winner 2017 Vino became 2nd Best Puppy of the show! He is now in the Netherlands, Belgium and Luxembourg Youth Champion what a great start of his show career. Vino won in august at the Brabant Cup in ‘s Hertogenbosch BOB Youth and becomes BOB at the age of 14 months!!! A day later he won at the Meierijshow also BOB Youth and BOS!! Vino become 2 BIS Puppy Winner 2017 Amsterdam in the main ring of honor. And at the Holland Cup 2017 Amsterdam he was selected at the last 6 BIS Puppy in the main ring of honor. And in Leuven (B) he becomes 5th BIS Minor Puppy in the main ring of honor. In Bonheiden (B) he becomes 6th BIS Youth in the main ring of honor. 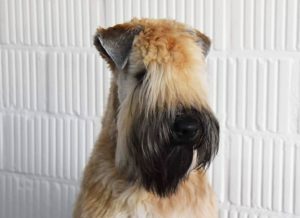 At the Wheaten Top 10 (2018) of the Breed Association “De Wheatens” he won the 5th place. * Hips dysplasia: HD A acc. International F.C.I. norm. * EVCO eye research: 100 % declared free.